With rural broadband being a growing area in New Zealand broadband connectivity and many great rural broadband providers covering different areas of New Zealand the Best Rural Broadband Provider category was always going to be closely fought. Rural connectivity is gaining increasing significance and the high quality entries we received in this area it is clear that rural broadband is in good hands. Thanks to all of the entrants and congratulations to the finalists. 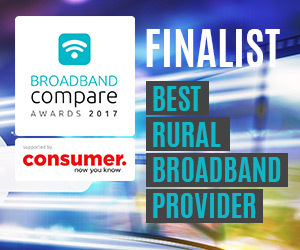 We look forward to presenting the Broadband Compare Awards Best Rural Broadband Provider trophy to the winning internet provider at the Awards evening taking place at the Sapphire Room, Ponsonby Central, Auckland on the 2 November.